We’d love your help. Let us know what’s wrong with this preview of The History of Bees by Maja Lunde. England, 1852. William is a biologist and seed merch In the spirit of Station Eleven and Never Let Me Go, this dazzling and ambitious literary debut follows three generations of beekeepers from the past, present, and future, weaving a spellbinding story of their relationship to the bees, to their children, and to one another against the backdrop of an urgent, global crisis. To ask other readers questions about The History of Bees, please sign up. I'm really trying go enjoy this book! Going in I was excited..all the great reviews! And I love bees. And dystopian futures novels. With a cautionary theme. But..wow. Its. Sooo. Slow. What's with the Wei Wen deal and it taking sooo long for us to find out what's wrong with him? Mo....laaassss...ess. LOL So I'm about one third into it. Should I slog on? Does it get better?? Is it worth the "sting" of boredom? Ciekawa historia z moralem, ale wydaje mi sie kanciasto przetlumaczona na polski. Czesto zdawalo mi sie, ze czytam tlumaczenie, a nie ksiazke. Co uwazacie? 3.5 Three stories that are connected, though how is not apparent until book's end. 1851, William, 2007, George and 2098, Tao, tied together by their dependency on bees. In 2098, the bees have all been wiped out, in China they pollinate by hand, a labor intensive endeavor. Each of these three have sons, so this is also very much about the bond and expectations between parent and child. Very slow start to this book, was tempted to put it down, but I have a profound interest in our environment, espe 3.5 Three stories that are connected, though how is not apparent until book's end. 1851, William, 2007, George and 2098, Tao, tied together by their dependency on bees. In 2098, the bees have all been wiped out, in China they pollinate by hand, a labor intensive endeavor. Each of these three have sons, so this is also very much about the bond and expectations between parent and child. Very slow start to this book, was tempted to put it down, but I have a profound interest in our environment, especially after the fires, storm, hurricanes and earthquakes that have ravaged so many areas. The lessening of the bee population has been on our nightly news, and it is something I have noticed myself in the area in which I live. Without bees and their pollination our food sources will collapse, the world as we know it unrecognizable, which is what happens in this novel. So I kept reading, and soon became better acquainted with these characters and how the author was putting her story together. This book is not fun to read, it is rather grim, us screwing up our environment could be nothing less, but also I think important. The ending was so fitting, and though sad, also ends with a ray of hope. It all ties together, all three stories,and in a round about way comes full circle. Rather ingenious. A book I ended up glad I had read. Unfortunately, this was a bit of a disappointment for me. I heard so many raving reviews about this book, so I totally expected this to really draw me in and leave a lasting impression, but that didn't really happen. Mostly this was down to the characters. I didn't get a good grip on them; they stayed very two-dimensional throughout the entire book. This is a shame, because I feel that a deeper connection to the characters would have changed my feelings drastically. The story is told from three d Unfortunately, this was a bit of a disappointment for me. I heard so many raving reviews about this book, so I totally expected this to really draw me in and leave a lasting impression, but that didn't really happen. Mostly this was down to the characters. I didn't get a good grip on them; they stayed very two-dimensional throughout the entire book. This is a shame, because I feel that a deeper connection to the characters would have changed my feelings drastically. The story is told from three different points of view, each taking place in a different time period. I found all of the individual stories interesting, but none of them really pulled on my heartstrings, despite having the potential to do so. Again, this is where a better character development and deeper look into their lives and feelings would have been needed. The chapters were all pretty short, which was another thing that bothered me (and I normally love short chapters!). Whenever the really interesting stuff seemed to start (a discovery, a new idea, etc. ), the chapter ended and the point of view changed. And when the story turned back to a character, time had already passed and the chapter picked up after all the exciting stuff had already happened and all you can read about now is the conclusions and the further actions the character is taking. Longer chapters would have been so much better! I needed more feelings and thoughts and emotions! رواية لا تُنسى، ومن أجمل ما قرأت. هي من ذلك النوع الناعم الذي يمنحك البصيرة ويريك عوالم غير مسبوقة. أحببتها وممتنة للترجمة البديعة. Without bees, the flowers were just flowers, not blueberries, not bread and butter. • Sichuan, China in 2098: Pollinating insects completely disappeared from Earth over half a century before, so humans have assumed the bees' role. In order to survive, humans have refined the arduous process of hand-pollination. Children are trained for the job as soon as they enter school and begin working in the fields when they turn eight years old. Like any parent, Tao wants her three-year-old son Wei-Wen to have more opportunities than she did. She spends her rare time off teaching him so that he can attend a special leadership-training school and avoid a lifetime of back-breaking labor. When Wei-Wen mysteriously collapses and is whisked away by the authorities, everything changes. Tao blames herself because she thinks it's her dreams for him that caused the accident. She's willing to sacrifice everything to find him. • Hertfordshire, England in 1851: William is a biologist whose academic specialty is superorganisms. Superorganisms are individual insects that function together as a single organism; they need each other in order to survive as a whole. William sank into a deep depression after his mentor belittled him for sacrificing his life's work to have a large family. When his passion reignites, he becomes obsessed with building the perfect beehive, one that will benefit both the beekeepers and the bees. He wants his son Edmund to continue his research, but Edmund is disinterested in his father's attempts to lure him into the family business. William's obsession with making his son carry on his legacy prevents him from seeing the true heir to his research. • Ohio, USA in 2007: George descends from a long line of beekeepers. He devotes his entire life to his bee farm and ensuring his bees are thriving. He wants his son to take over the farm, but his son is more interested in his college studies and cultivating his writing career. The stress of bee farming increases when bee colonies begin disappearing in the southern USA. While his bees are doing fine so far, the future of his farm becomes uncertain. She read about knowledge. About acting against one’s instincts, because one knows better, about how in order to live in nature, with nature, we must detach ourselves from the nature in ourselves. And about the value of education. Because this was what education was actually about, defying the nature in oneself. The History of Bees is about letting go and resisting the impulse to exert control over everything. Every parent and mentor in this book has a fixed vision for their child's or apprentice's future. There seems to be the expectation that the next generation "justify [their] position on this earth." Trying to tame the natural order has disastrous consequences. Each character has a firm idea of their child's place in the universe and the means through which that place will be achieved, but it's not until they relax their control that they are able to gain clarity. One major lesson is that one doesn't have to choose between life and passion. Sometimes that passion is our contribution to our families and the future. A single person’s life, a single person’s flesh, blood, body fluids, nerve signals, thoughts, fears and dreams meant nothing. My dreams for [my son] didn’t mean anything, either, if I failed to put them into a context and see that the same dreams had to apply to all of us. There are so many beautiful moments of interconnection throughout the story. Tao decorates her son's room with fluorescent star stickers that used to adorn her own childhood room. She feels as if she created "a bond between my own childhood and his, between us and the world, between the world and the universe." On a larger scale, there's a moment when Tao watches a documentary about the beekeepers who were affected by Colony Collapse Disorder. History comes alive for her. At another time she may have thought the interviews were just "testimonies from another time" from "people who had nothing to do with [her]," but with experience she realizes that "every single personal catastrophe meant [her] own." This book was originally published in Norwegian, but I read the English translation. I chose this book because I love dystopian fiction and the "in the spirit of Station Eleven and Never Let Me Go" blurb called my name. I can see the Station Eleven comparison more clearly than Never Let Me Go. The thing that draws me to Kazuo Ishiguro's work is the haunting, melancholic atmosphere and I just didn't get that from this book. I debated on whether to round my star rating up on down. I decided to round up because somehow it managed to worm its way into my heart! The downsides of this book were the pacing and some of the characterization. It was slowly paced at times, so my interest waxed and waned. It occasionally comes across as a "message" book, but it's not overly heavy-handed. It almost had a YA feel to it—especially George's chapters—even though there are no young adult main characters. (I found out after writing this review that this is the author's first novel for adults.) Tao was my favorite of the three perspectives. She felt the most human, while William and George felt like characters. Even though the male characters didn't feel as authentic to me, they still had interesting stories. William is strange and insufferable, but his passion for the natural world is contagious. Some of my favorite chapters were actually in his sections, when he talks about the lifecycle of bees (at the 45% & 87% mark of my copy). George is old-fashioned and set in his ways. He's never able to say the right thing. His folksy simplicity didn't always ring true to me, but I could understand the dreams and fears that motivated his actions and resentments. Alone she’s nothing, a part so tiny that it’s insignificant, but with the others she’s everything. Because together they’re the hive. In The History of Bees, the author draws "connections between the small and the large, between the power of creation and creation itself." Every living thing in this book is "fighting the ordinary, daily struggle" for their descendants and survival. The three protagonists are decades, sometimes centuries, apart. They don't know each other and they may not live to realize how essential their contributions were, but together they make a huge impact on mankind's fate. The characters' lives and the lives of their offspring didn't go as planned, but their creative solutions influence humanity's future path. This book gave me a larger appreciation for all those who've come before us and made an impact on our lives, even if they would never get a chance to benefit from it. * My biblical knowledge is lacking, so I wanted some more context with this quote. This sermon helped me out: Slaves of Righteousness, Romans 6:19-23. It also has some analysis of 1984 and Brave New World, which was interesting! * A reassuring article to read after reading this book: Bees Are Bouncing Back From Colony Collapse Disorder. - It might feel like being hungry and knowing you're never going to get enough to eat. - It might feel like helplessly watching your partner becoming progressively more estranged from you, until you can no longer touch them or even talk to them. - It might feel like discovering that your life work, everything you've ever tried to do, was a waste of time and you might as well not have bothered. - It might feel like realising that your child has been taken away, and nothing you can do will ever bring them back. I felt it was too simplistic. I never really connected with any of the three stories. I kept waiting for a plot twist or something that would really catch me, either emotionally or intellectually, but it continued straight all the way to the end. The characters lack depth and everything is over-explained. The ending attempts to bring together the threads, but it feels more like an afterthought to tidy up loose ends, and not something that touches upon the core of the story. لا بد أن البعض منكم، خصوصا إذا كان شقيًا مثلي في طفولته، تعرّض إلى لسعة مؤلمة من نحلة غاضبة بعد أن نكش خليتها بطرف عصا أو رماها بقطعة حجر. ولا بد كذلك أن البعض منكم تمنى مثلي، وهو يمسح بقايا المخاط والدموع من على وجهه، بينما تدلك والدته مكان لسعة النحلة لو اختفى هذا النحل الشرير من العالم! تذكرت أمنيتي الطفولية تلك وأنا ألتقط هذه الرواية التي ترجمتها دار المنى مؤخرًا، وكُتب على غلافها الغلفي بأنها "رواية ذكية ورائعة"، وقلت لنفسي يبدو أن هذه الكاتبة، والتي لا بدّ وأنّها تعرّضت للسعة نحلة في طفولت لا بد أن البعض منكم، خصوصا إذا كان شقيًا مثلي في طفولته، تعرّض إلى لسعة مؤلمة من نحلة غاضبة بعد أن نكش خليتها بطرف عصا أو رماها بقطعة حجر. ولا بد كذلك أن البعض منكم تمنى مثلي، وهو يمسح بقايا المخاط والدموع من على وجهه، بينما تدلك والدته مكان لسعة النحلة لو اختفى هذا النحل الشرير من العالم! تذكرت أمنيتي الطفولية تلك وأنا ألتقط هذه الرواية التي ترجمتها دار المنى مؤخرًا، وكُتب على غلافها الغلفي بأنها "رواية ذكية ورائعة"، وقلت لنفسي يبدو أن هذه الكاتبة، والتي لا بدّ وأنّها تعرّضت للسعة نحلة في طفولتها، لم تكتفِ بأمنية، كما فعلت أنا، ولكنها ذهبت أبعد من ذلك وتخيلت عالمًا بدون نحل ... انتقامًا منه ربّما كما ظننت في بادئ الأمر. لكن ما لم يُكتب على الغلاف الخلفي، ولا الأمامي، وتجب كتابته هنا .. هو أنّ هذه الرواية بقدر ما هي موجعة كلسعة النحل، إلا أنها لذيذة جدًا كعسله. والمؤلفة لم تكتب الرواية انتقامًا من النحل، بل افتح أعيننا على الكارثة التي تهدد وجوده بسبب الاستخدام المفرط للمبيدات وانتشار الآفات الدخيلة، والتي بدأت فعلًا بالتأثير على أعداده التي بدأت بالتناقص كثيرًا منذ عام ٢٠٠٦. يُمكن لرواية "حين اختفى النحل" أن تُقرأ على عدة مستويات، فهي رواية ديستوبية مروعة تصور لنا كيف سيبدو العالم لو اختفى النحل، وهي رواية تاريخية وعلمية تسرد لنا المحاولات البشرية الأولى لترويض النحل (إن جاز التعبير)، وهي هجاء سياسي مرير للأنظمة التي تحول المجتمعات إلى آلات صمّاء، كما أنها رواية رمزية ذكية تؤكد فكرة خلود الكتب .. الورقية منها تحديدًا. على الرغم من وجود العديد من الشخصيات الرئيسية التي سنكتشف كيف تتقاطع مصائرها في نهاية الرواية إلا أن النحل هو الشخصية الرئيسية، وحضوره في الرواية حضور إيجابي، على نحو ما، فالنحل هو من يُخرج "ويليام" من كآبته في إنجلترا عام 1852، وهو الذي يعيد ترتيب العلاقة بين "جورج" وابنه "توم" في أمريكا عام 2007، وهو الذي يدمّر ومن ثم يعيد بناء حياة "تاو" في الصين عام 2098. إنها بالفعل، كما كُتب على غلافها الخلفي، رواية رائعة وذكية. Rating 4* out of 5. Read in Norwegian. I feel a teeny weeny bit foolish reviewing this book in English, since it hasn't yet been released in any other country. It's been sold to several and it certainly has international appeal, and thus, I choose to review in English anyway. This is probably the most un-Norwegian book by a Norwegian author I have ever read. It works though. The book is beautifully written and a joy to read for sheer composition. There are three different plots on different timel Rating 4* out of 5. Read in Norwegian. I feel a teeny weeny bit foolish reviewing this book in English, since it hasn't yet been released in any other country. It's been sold to several and it certainly has international appeal, and thus, I choose to review in English anyway. This is probably the most un-Norwegian book by a Norwegian author I have ever read. It works though. The book is beautifully written and a joy to read for sheer composition. There are three different plots on different timelines - William in 1952, trying to figure out a more sensible bee cube. George in 2007, who is experiencing colony collapse disorder and has troubled relations with his son. Tao in 2098, a time when all the bees are gone, there are world-wide food shortages and all farm plants have to be hand pollinated. The plotlines converge in the end. They all involve bees so there is coherence in them from the start anyway. The book deals with family dysfunction as much as with bees. There is a strong voice of criticism raised against mono-culture farming. It is truly amazing that so few can feed so many, but the system we have set up is largely based on poison and quite fragile. I don't have any solution up my sleeve, we cannot feed 7 billion people with ecological farming. Un trecut, un prezent si un viitor distopic. Maja Lunde poarta cititorul prin trei epoci diferite: incepand din Anglia victoriana, trecand prin America zilelor noastre si pana in viitor in China anului 2098, un viitor in care albinele au disparut precum si consecintele disparitiei acestora. Sunt trei personaje principale in roman: William - un comerciant britanic de la mijlocul sec. al XIX-lea, George - un apicultor contemporan din Midwest SUA si Tao - o tanara mama din China anului 2098, care pet Un trecut, un prezent si un viitor distopic. Sunt trei personaje principale in roman: William - un comerciant britanic de la mijlocul sec. al XIX-lea, George - un apicultor contemporan din Midwest SUA si Tao - o tanara mama din China anului 2098, care petrece ore in sir polenizand manual florile pomilor dintr-o livada. Pe cei trei ii leaga probleme existentiale cauzate de lipsa albinelor din viata lor, precum si relatia parinte-copil: William si fiul lui, Edmund, care o ia pe cai gresite si ajunge sa sfârșească tragic; George, care trăiește în zilele de început ale dezastrului ecologic din Statele Unite, se luptă să-și mențină albinele, în timp ce respinge noile tehnici agricole, menite să eficientizeze procesul de apicultură. Este dezamăgit de fiul său Tom, care a plecat recent la facultate și pare complet dezinteresat de profesia tatălui său, și mult mai mult decat atat, este atras de dorinta a urma un doctorat. Ambii fii fiind asadar neinteresati sa preia si sa continue pasiunea tatilor lor pentru apicultura. Povestea lui Tao este cea care deschide romanul fiind si cea mai captivanta dintre cele trei, si are loc dupa dezastrul mondial prin care albinele au disparut. Pe langa stresul si epuizarea cauzate de munca ei (polenizarea manuala a florilor copacilor, pentru ca acestia sa poata da roade mai departe), Tao se străduiește să ii ofere o viață mai buna fiului său de trei ani, Wei-Wen, iar încercările sale de a-i oferi cea mai bună educație copilului îi afecteaza relatia cu sotul ei, Kuan. Când Wei-Wen dispare în mod misterios (dupa un picnic luat in natura impreuna cu parintii, acesta este gasit dupa putin timp inconstient), Tao porneste in cautarea baiatului in capiatala Beijingului care este afectata de Colaps dupa producerea dezastrului ecologic. 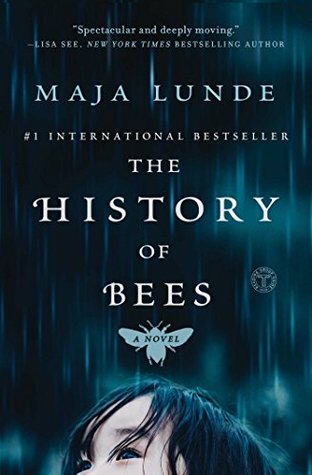 By a Norwegian novel debut author, Maja Lunde; translated from Norwegian The History of Bees is really well written. While I give 80% of that credit to Lunde, a bit of credit is due to the translator Diane Oatley. Following three different timelines, all related to bees in some way, this is a literary masterpiece. We have 1898, 2007 and 2089 as our time periods. Set in completely different parts of the world as well; England, USA and China respectively. Of c This is wonderful! Of course the future timeline starts off the most interesting because we get to learn what Lunde sees as our (and the bees) world in 80ish years. As always it's a bit bleak. In 2007 we are treated to honey production at the farm scale (not industrial) but still as the main income source. And of course, anyone who is aware of the bee situation today knows that this was around the time colonies were starting to suddenly collapse with no reason. The past starts off slow but becomes really interesting as a man with an awful lot of children starts innovating his own type of beehive. The innovation is to allow for easier harvesting of the honey that doesn't require as many bees dying when you open the hive to harvest. This is where Lunde really excels. Her characters are so life-like. The point of views (one per timeline) we are treated to are parents with children at various ages. Relationships between parents and their children are what The History of Bees is really about; and what makes it a solid 'typical book club' pick. In all cases the parents wish better for their children, or at least speak of a legacy to help their children have better lives than their own in the future. A very typical parental obsession; but portrayed here in a way which even adults without children (like myself) can understand and appreciate. I've looked into a small beehive for our yard before with no success because we don't think we can meet the space regulations. So going into this I knew a teeny tiny bit about colony collapse disorder (CCD). Now after reading this I'm determined to have a hive at some point under my care. The bees are the link between our three timelines but they are also the link to humanity's survival. Pollination is key for most fruits and many other food sources to grow. Now let's be specific here for a minute we are talking about honeybees. There are lots of kinds of bees but the ones that are critical make the honey. It's clear, even to a very amateur prospective beekeeper, that Lunde has done her homework here. Everything that happens in the 2007 timeline has already happened and her descriptions and explanations of the situations are anything but boring. Most of our characters are in love with bees and so they speak or think passionately about it. With just the right amount of truth and science built in. A very enjoyable way to learn about honey bees! So for me the book felt like it was all about the bees (and bees are what drew me to it). Even though the bees are the link across time, the reality is that The History of Bees is about people coping with being a parent in their given timeline. The bees just make it sweeter. The History of Bees was effortless to read. The characters and settings seemed to leap off the page for me. With the addition of a very relevant, important and interesting topic of bees thrown in this was a lovely piece of literature and one I look forward to adding to my print book collection (the next time I'm at a bookstore). In my book collection these days there is no higher honour than being an ebook or review copy that I read and decide to buy a print copy of. Lunde has earned this honour and I can't wait to read her next novel. Rating wise this book is a tough one for me to call. There were parts of it that were excellent while also having parts that seemed to drag a bit. However, the author, Maja Lunde, was able to weave a tale of three generations of bee keepers. Each one covered a time span. The past, was represented by William, a seed keeper who wants to build a perfect bee hive thus securing his fame and his family's future in the world he inhabits. In the present time, we meet George who battles the modern age in Rating wise this book is a tough one for me to call. There were parts of it that were excellent while also having parts that seemed to drag a bit. However, the author, Maja Lunde, was able to weave a tale of three generations of bee keepers. Each one covered a time span. The past, was represented by William, a seed keeper who wants to build a perfect bee hive thus securing his fame and his family's future in the world he inhabits. In the present time, we meet George who battles the modern age in farming as he strives to bring his son into the world and the passion he holds for the bees. Finally, there is Tao presenting the future where bees are no longer living. She and her husband are employed in the process of painting pollen unto the fruit trees to ensure not only their survival but also that of the people who now exist in a world that no longer resembles what we have come to know. These three characters come together with their families to provide the reader with many glimpses into their family dynamics and the way of life each lead in the world that they inhabited. For this reader Tao's story was the most interesting. Her son is taken ill on a day trip into the country and is whisked away mysteriously. She begins a search for him, leaving her husband behind and through her travels we see a world of the future that is none too bright and exceedingly sad. I found this book to be very earthy, one that paints a strong picture of our reliance on these little creatures that bind together in their hive and work as a unit. They definitely have something to teach we humans about binding together to accomplish goals. So now it comes to rating this novel. In my mind I feel that the subject matter rates a five. However, because the writing was at time wandering and somewhat disjointed, I will give it a four. I realize that this book was translated into English so some of this meandering might have been caused by that issue. Thank you to NetGalley and Touchstone for providing me with an advanced copy for an unbiased review. Ich habe lange zwischen 2 und 3 Sternen geschwankt und mich nun letztlich für die bessere Note entschieden, weil das Buch durchaus unterhaltsam geschrieben ist. Zudem mag ich es, wenn verschiedene Handlungsstränge neben her laufen und am Ende verwoben werden. Zudem wird ein interessantes Thema mit dem Bienensterben aufgegriffen. So viel zu den positiven Aspekten. Ich war aber auch enttäuscht von dem Buch, denn der Titel lässt vermuten, dass die ökologischen Aspekte der Bienen und die Konsequenze Ich habe lange zwischen 2 und 3 Sternen geschwankt und mich nun letztlich für die bessere Note entschieden, weil das Buch durchaus unterhaltsam geschrieben ist. Zudem mag ich es, wenn verschiedene Handlungsstränge neben her laufen und am Ende verwoben werden. Zudem wird ein interessantes Thema mit dem Bienensterben aufgegriffen. So viel zu den positiven Aspekten. Ich war aber auch enttäuscht von dem Buch, denn der Titel lässt vermuten, dass die ökologischen Aspekte der Bienen und die Konsequenzen ihres möglichen Aussterbens für die Menschheit und die Flora, stärker im Mittelpunkt stehen. Hier hat aber die Autorin ihren Schwerpunkt nicht darauf gelegt, denn ihr sind die drei Einzelschicksale wichtiger in der Darstellung. Lunde ist eigentlich eine Kinder- und Jugendbuchautorin und so kam mir das Buch auch vor. Das soll jetzt gar nicht abwerten klingen. Empfängergerechter Schreibstil ist generell wichtig. Mir waren die Sätze aber zu einfach und zu kurz gehalten. Man könnte jetzt sagen, dass William, George und Tao, ihre Geschichten ja quasi selbst aus der POV-Sichtweise erzählen und ihre Art Tagebucheinträge in der einfachen Sprache authentisch sind. Wenn ich aber Authentizität will, dann kann ich nicht William im Jahr 1852 dieselbe Sprache sprechen lassen wie Tao im Jahr 2098. Vielleicht bin ich da aber auch von der hohen literarischen Qualität des Wolkenatlas geprägt, der auf geniale Weise die Sprache an die Zeit anpasst. A slow-burner, but loving the exploration into the vital importance of bees. Bees are absolutely my favourite insect, so a book with bees in the title was never going to be overlooked by me. As ever, I wasn't sure what to expect - and was mostly engaged, with just a few occasions where I was left scratching my head. The story follows three narratives - William, a bee-hive designer /obsessive from the Victorian era, Geo I received a copy of this book from Netgalley, in exchange for an honest review. The story follows three narratives - William, a bee-hive designer /obsessive from the Victorian era, George, a grumpy old bee farmer in what felt like modern times, and Tao, a low-level pollinator in the future. Their stories, though very different, had fascinating similarities. All were in some way searching for 'lost' sons. All of their lives were in some way dependent on bees, and all were directly / indirectly affected by the great bee collapse. I'm paraphrasing here, it was called something else in the book! Tao was the most interesting, mainly because the author had very successfully created this dystopian future minus the bees, and it felt alarmingly possible. The tense relationship between George and his son was likewise fascinating, though there were times when the narrative about William felt a little stagnant. One thing that worked fabulously was how the narratives were tied together at the end, though it's quite a big ask of the author to expect their readers to wait so long to get a hint of this clever ending. However, respect for doing it...it worked well. Overall, an engaging, well plotted read. Definitely between a 3.5/4 star read for me. Here we meet William, George and Tao. Our past, present and future in regards to our history with bees. Each character embodies a different personal, historical or familial crisis. In this book change is painful. Humanity is destroying itself trying to tame bees globally; and this relationship is also imprinted on our intimate relationships. All characters have varying relationships with their sons - it is rather symbolic to tie alongside earth’s relatio Definitely between a 3.5/4 star read for me. All characters have varying relationships with their sons - it is rather symbolic to tie alongside earth’s relationship with bees. This book took me a little while to get into, but once Tao wrapped me around her finger I was completely sold with the story. Ich konnte das Buch kaum weglegen. Bei allen drei Protagonisten (insbesondere bei Tao) konnte ich mitfühlen. Ich finde Maja Lunde hat den Grat zwischen Fakten und Fiktion sehr gut getroffen und in einem simplen Stil wiedergegeben. Empfehlenswert. Świetne czytadło. Połknąłem ją w kilka dni. Czytałem z wypiekami. A kilka razy łza zakręciła mi się oku. Ale mimo to mam do tej książki sporo zastrzeżeń. Żeby jednak nie było, że jestem marudnym pierdzielem - zacznijmy od zalet. Największą jest wspaniałe ekologiczne przesłanie. Po przeczytaniu tej książki człowiek aż chce zatroszczyć się o środowisko, zaczyna kochać pszczółki a zanim rozgniecie komara, zastanowi się dwa razy. Piszę to prawie bez ironii. Bo ja i bez tej książki mam takie podejście Świetne czytadło. Połknąłem ją w kilka dni. Czytałem z wypiekami. A kilka razy łza zakręciła mi się oku. Największą jest wspaniałe ekologiczne przesłanie. Po przeczytaniu tej książki człowiek aż chce zatroszczyć się o środowisko, zaczyna kochać pszczółki a zanim rozgniecie komara, zastanowi się dwa razy. Piszę to prawie bez ironii. Bo ja i bez tej książki mam takie podejście do życia, ale mam szczerą nadzieję, że parę osób, które naturą się nie przejmuje - po lekturze - zmieni zdanie. To przesłanie jest wg mnie lepsze niż na przykład w "Sekretnym życiu drzew", które jest raczej nudne. Zaletą jest także język. Prosty, bez nadęcia nawet w szczególnie wzruszających czy ważnych momentach. Zalet jest wiele innych, ale są pomniejsze więc przejdźmy to drobnych problemów. Przeszkadzało mi to, że to tak naprawdę ckliwa historyjka. Bardzo przewidywalna w wielu aspektach. Powód choroby chłopca zgadłem od razu. Powiązania między bohaterami też prawie od razu były oczywiste, niespodzianką (ale nie zaskoczeniem) było tylko - jak konkretnie zostaną te powiązania przedstawione. No i najważniejszy dla mnie zarzut - który stawia dla mnie pod znakiem zapytania literacką wartość tej książki. Forma. Krótkie rozdziały z imionami bohaterów jako tytuły i bardzo plastyczne opisywanie rzeczywistości. To podobne rozwiązanie do "Gry o tron". I tak jak w przypadku GoT tak i tu miałem wrażenie, że autorka pisała książkę, ale oczyma duszy wiedziała już scenariusz i film, jaki na podstawie tej książki powstanie. To ma na pewno wiele zalet. Krótkie, dynamiczne rozdziały powodują, że świetnie się czyta w autobusie. Ale niestety literatura na tym cierpi. W pewnym momencie ma się wrażenie, że to "Serial o pszczołach" a nie "Historia pszczół". "Jedna pszczoła bowiem jest niczym, cząstką tak małą, że całkiem pozbawioną znaczenia, natomiast razem z innymi jest wszystkim. Bo razem stanowią pszczelą rodzinę." Ta książka przewijała mi się naprawdę wiele razy, dużo osób mówiło o niej naprawdę pozytywnie, ale bałam się po nią sięgnąć, bo odnosiłam wrażenie, że może być nudna. Aż pewnego dnia (1,5 miesiąca temu) jakoś nagle naszła mnie ochota na nią i zrobiłam spontaniczny zakup. Czy żałuję? Absolutnie nie! Historia tej powieści toczy się w t "Jedna pszczoła bowiem jest niczym, cząstką tak małą, że całkiem pozbawioną znaczenia, natomiast razem z innymi jest wszystkim. Bo razem stanowią pszczelą rodzinę." Historia tej powieści toczy się w trzech wiekach. Na początku poznajemy przyszłość w roku 2098, główną bohaterką jest Tao, która pracuje od rana do wieczora przy ręcznym zapylaniu drzew, ponieważ wszystkie pszczoły na świecie wyginęły. Pewnego dnia ginie jej synek i Tao wyrusza na poszukiwania, a to na co trafi będzie przełomowe dla ludzkości. Następny bohater to Wiliam z roku 1852, pracuje nad pewnym projektem, nie wie tylko, że w innej części świat ktoś wpadł na ten sam pomysł. I ostatnia nasza postać to Geogre z 2007 r., prowadzi on hodowlę pszczół i z całego serca pragnie by jego syn odziedziczył po nim farmę, niestety Tom ma zupełnie inne plany. W dodatku pszczoły zaczynają stopniowo na całym świecie wymierać. Historia każdej z tych osób jest naprawdę bardzo ciekawa i naprawdę nie potrafię wybrać, która bardziej mi się podobała. Śledziłam losy każdego z nich z równym zainteresowaniem. Najlepsze jest to, że autorka stworzyła bohaterów bardzo realistycznych i naprawdę dobrze nadała im cechy charakteru. Książka miała być o pszczołach, a tak naprawdę one są tylko tłem całej fabuły. Dobrym tłem. Śledzimy życie i losy bohaterów, które po prostu są powiązane z pszczołami. Ale to nie jest wada, lecz zaleta. Chciałabym częściej trafiać na powieści z dobrym tłem fabularnym. Szkoda tylko, że autorka nie nadała więcej dramatyzmu w związku z utratą pszczół, bo jednak one są najważniejszą częścią naszego życia, więc byłoby dobrze, gdyby ta katastrofa była bardziej dramatyczna, może byśmy bardziej zdawali sobie z tego sprawę. W ,,Historii pszczół" nie ma jakiejś porywającej akcji, ale o dziwo książka nie nudzi. Śledzenie losów bohaterów naprawdę absorbuje. Nie próbowałam nawet myśleć, jak to wszystko się skończy, czytałam ją i dałam się porwać opowieści, tak po prostu. I chociaż książkę czyta się naprawdę szybko, to przeczytanie jej zajęło mi kilka dni, nie chciałam jej szybko skończyć, chciałam się nią delektować, dłużej zostać z bohaterami, tak aby nigdy nie zapomnieć tej historii. Podkreślę, że jest ona również pełna emocji. Naprawdę cieszę się, że kupiłam ją i poznałam tę piękną, sączącą i mądrą powieść. Autorka napisała kawał wyśmienitej lektury. A slow, but interesting and enjoyable read. For starters, our art team did an incredible job with the U.S. cover. Absolutely incredible. And when you see it in person, it's even more beautiful—tons of gold, special effects, I can't get over it. But that's what we had to do to live up to the gorgeous story inside. Would a world without bees be a world without us? You'll have to read it to find out. 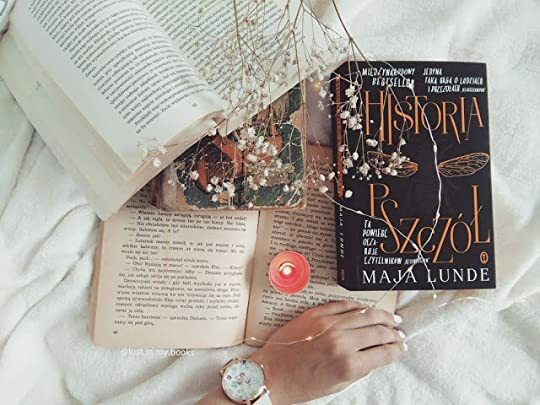 This book consists of three connected stories which their connection is not clear until almost the end of the book. When the connection is revealed the three stories become one and it’s actually story of us, humans. 1851/ England: William, an academic which tries to design a new bee hive in order to observe their lives. He’s obsessed with first his research then his son Edmund who seems ignores him all the time. 2007/USA. George. He’s from a generation of bee keepers/ Organic bee keeprs. He takes This book consists of three connected stories which their connection is not clear until almost the end of the book. When the connection is revealed the three stories become one and it’s actually story of us, humans. 2007/USA. George. He’s from a generation of bee keepers/ Organic bee keeprs. He takes taking care of bees very seriously and tries to win his to-be-writer son over and has him back to family business. 2098/China. Tao. She is a corn worker in an era that everything looks doomed, there is no education and children become workers at an early age. Tao tries to teach his young son what she knows in rare time off she has but when one day the family goes to picnic and the son collapses everything changes for them. The main theme of the book is what we do with our environment and how it would affect our lives in long term. Bee’s fate is the symbol of disaster coming to humans due to playing too much with nature and neglecting alarming evidences that we screw too much to recover. I really liked how three stories were connected at the end. It was done quite beautifully. At some point it might seem slow but for sure it deserves to be read. this sounds kinda like cloud atlas except with extra bees, which essentially sounds like... MY PERFECT BOOK!!!!!! 1852: Der Biologe und Samenhändler William lebt zusammen mit seiner Frau, seinem einzigen Sohn und seinen sieben Töchtern in England. Er forscht über Bienen und möchte seinem Sohn Edward und seinem Mentor Rahm imponieren und verschreibt sich ganz der Bienen und ihrer Lebensweise. Er verfällt nach mehreren Rückschlägen immer wieder in schwere Depressionen und kann sein Bett nicht mehr verlassen und ist somit seiner großen Familie keine große Hilfe Gelingt es ihm dennoch Erfolge durch seine Forsch 1852: Der Biologe und Samenhändler William lebt zusammen mit seiner Frau, seinem einzigen Sohn und seinen sieben Töchtern in England. Er forscht über Bienen und möchte seinem Sohn Edward und seinem Mentor Rahm imponieren und verschreibt sich ganz der Bienen und ihrer Lebensweise. Er verfällt nach mehreren Rückschlägen immer wieder in schwere Depressionen und kann sein Bett nicht mehr verlassen und ist somit seiner großen Familie keine große Hilfe Gelingt es ihm dennoch Erfolge durch seine Forschung zu erlangen? 2007: George lebt in Amerika, Ohio, mit seiner Frau Emma und seinem Sohn Tom. Er betreibt eine Imkerei und möchte, dass sein Sohn diese eines Tages übernimmt. Doch dieser beschließt eine akademische Laufbahn einzuschlagen. Nicht nur das trifft den Vater, sondern auch ein großer Kollaps bahnt sich an. Immer mehr Bienen sterben-nicht nur in seiner Imkerei, sondern die ganze USA ist vom großen Bienensterben betroffen. Kann er sich und seine Familie über Wasser halten? 2098: Tao lebt mit ihrem Mann Kuan und ihrem dreijährigen Sohn Wei-Wen in China. Dort geht sie jeden Tag ihrer Arbeit als Handbestäuberin nach, denn Bienen gibt es schon lange keine mehr. Nicht nur die Insekten mussten einen großen Verlust verzeichnen, auch die Menschen sind nicht mehr so zahlreich auf der Erde wie ein Jahrhundert zuvor. Eines Tages erschüttert der Unfall des kleinen Sohnes das Ehepaar und auch die Regierung ist auf den Vorfall aufmerksam geworden. Die norwegische Autorin Maja Lunde erzählt in drei Handlungssträngen, auf drei Kontinenten, drei Geschichten. Jede von ihnen hat eines gemeinsam, den Bezug zu Bienen. Wir erleben die anfängliche Erforschung von Bienenstöcken, die Anfänge des Bienensterbens und eine mögliche Zukunft in der es keine Bienen mehr gibt und wie die Menschheit mit dem Verlust der Insekten vor Jahrzehnten umgeht. Auch wenn die Geschichten in verschiedenen Jahren spielen und auf verschiedenen Kontinenten, wird die Abhängigkeit voneinander sehr deutlich. Der Leser wird durch kurze Kapitel, welche sich immer wieder abwechseln durch die Geschichte der Bienen geführt. Jede Familie kämpft mit Existenzängsten, welche sehr von den Bienen abhängt. Auch die Beziehung der Erwachsenen zu ihren Kindern wird deutlich und die Bienen haben einen sehr starken Einfluss darauf. Jeder Hauptcharakter hat seine Eigenarten, die den Leser manchmal zweifelnd zurücklässt. Alle drei Handlungsstränge sind spannend und interessant. Der Leser weiß vom Anfang an auf was es hinausläuft, auf das große Bienensterben, und leidet mit allen drei Protagonisten mit. Auch wenn die verschiedenen Personen mit unterschiedlichen Problemen zu kämpfen haben, dreht sich alles um die Bienen, um die Existenz und um die Familie, insbesondere das Verhältnis zu den Kindern. Die Bienen sind hier das Gerüst, das alles aufrechterhält und lebensnotwenig ist. There are three stories in this wonderful novel about the history and destiny of bees and their ties to humanity. The stories take place in 1851, 2007 and 2098. 1851 tells the story of British shopkeeper William Savage, whose dream is to build a better bee hive to ensure his children a better future. 2007 centers on George and his son, Tom. George is a beekeeper who longs to build up his business together with Tom, but Tom’s longings lie elsewhere. 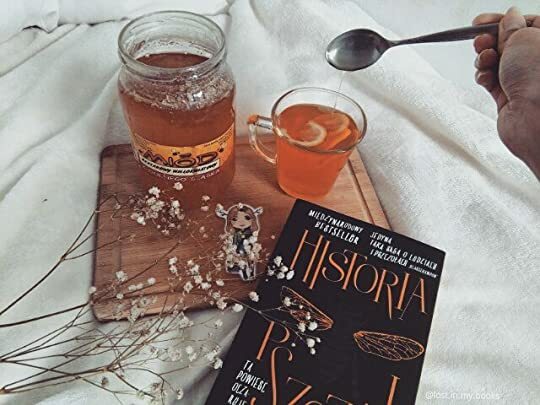 In 2098, Tao has the horrendous job of hand pai There are three stories in this wonderful novel about the history and destiny of bees and their ties to humanity. The stories take place in 1851, 2007 and 2098. 1851 tells the story of British shopkeeper William Savage, whose dream is to build a better bee hive to ensure his children a better future. 2007 centers on George and his son, Tom. George is a beekeeper who longs to build up his business together with Tom, but Tom’s longings lie elsewhere. In 2098, Tao has the horrendous job of hand painting pollen on trees in an effort to provide enough food for the Chinese inhabitants. There are no longer bees in her world. It’s a very physically taxing job and she fears for her little son who will soon be old enough to join the workers. But then tragedy strikes and Tao sets off on a perilous journey looking for answers. I absolutely loved this book. Each of the three stories touched my heart. The chapters are short and I would no sooner get pulled into one story than the author would switch to one of the other stories so there are often cliffhangers. I was never disappointed to switch as I found each of the stories as fascinating as the other. This style of writing really moved the book along and kept me wanting to know more. This Norwegian author cleverly maps out this beautifully written book so that each of the stories have a final connection. Bees. Such little creatures but so very important to our existence. Our world has seen what might happen should bees disappear completely. The author has provided a fascinating look at the beginning of bee keeping, the period when bee colonies first started encountering difficulties and what the future might look like without hard working bees. Even more than a study of bees told in a very moving way, this book also touchingly delves into the bond of parents and their children. Blending historical, contemporary and future story lines, this inventive novel, originally published in Norway in 2015, is a hymn to the dying art of beekeeping and a wake-up call about the environmental disaster the disappearance of bees signals. The plot strands share the strong themes of troubled parenthood and the drive to fulfill one’s purpose. Like David Mitchell or Louisa Hall, Lunde juggles extremely different time periods and voices admirably. The only sections of the book that dragged Blending historical, contemporary and future story lines, this inventive novel, originally published in Norway in 2015, is a hymn to the dying art of beekeeping and a wake-up call about the environmental disaster the disappearance of bees signals. The plot strands share the strong themes of troubled parenthood and the drive to fulfill one’s purpose. Like David Mitchell or Louisa Hall, Lunde juggles extremely different time periods and voices admirably. The only sections of the book that dragged for me were those in Tao’s narrative that explain the world’s collapse. I find that it’s best for speculative fiction in this vein (Margaret Atwood et al.) to leave the exact how of the environmental catastrophe to the reader’s imagination, as a blow-by-blow can end up feeling tedious. However, from page to page this is a very readable novel that hardly seems like a translation. This is a beautifully written story with an incredibly terrifying message. If the bees die, so do we. Simple as that. The three interconnected timelines focus on bees in the past, present and future. The past timeline deals with the invention of better beehives to aid in the study of bees. It doesn't sound super exciting but this family has a lot going on and they are quite interesting. I especially loved Charlotte, the budding feminist who doesn't let her gender hold her back from reading and, This is a beautifully written story with an incredibly terrifying message. If the bees die, so do we. Simple as that. The three interconnected timelines focus on bees in the past, present and future. The past timeline deals with the invention of better beehives to aid in the study of bees. It doesn't sound super exciting but this family has a lot going on and they are quite interesting. I especially loved Charlotte, the budding feminist who doesn't let her gender hold her back from reading and, gasp, thinking! The present timeline concerns a bee farm and the family who tends it. They also have a ton of personal issues which come to a head when CCD (Colony Collapse Disorder) hits their farm and the bees disappear. This is happening in real life RIGHT NOW which is absolutely horrifying and infuriating. No one knows the cause but it seems to be linked to pesticides and climate change. If we don't start taking better care of the Earth and the plants and animals on it we will be doomed. This leads directly to the future timeline which is a world without bees and other pollinators. There is mass starvation, the United States collapses completely. China survives, although barely, mainly because they have enough of a workforce to pollinate fruit trees by hand. The main character in this section is one of these human bees and spends long days in trees painting pollen on pear tree flowers. This idea blew my mind! Just imagine all of the labour required to pollinate every tree and plant by hand. It's insanity! Despite all this work the Chinese people are still starving and there are some truly bone chilling scenes in this section. Schon länger hatte ich dieses Buch auf dem Schirm, jetzt habe ich es im Rahmen ekner Leserunde auch endlich verschlungen. Verschlungen trifft es auch gut, denn es hat einen recht klaren Erzählstil, der immer eine unbestimmte Melancholie durchscheinen lässt. So etwas liebe ich und auch diesmal konnte es mich überzeugen. Wir verfolgen die Geschichten dreier Familien, Jahrhunderte getrennt und doch irgendwie verbunden. Jeder der Protagonisten hat mir seinen eigenen Problemen zu kämpfen, die sehr sta Schon länger hatte ich dieses Buch auf dem Schirm, jetzt habe ich es im Rahmen ekner Leserunde auch endlich verschlungen. Wir verfolgen die Geschichten dreier Familien, Jahrhunderte getrennt und doch irgendwie verbunden. Jeder der Protagonisten hat mir seinen eigenen Problemen zu kämpfen, die sehr stark mit der Zeit, in der sie lebten, zu tun hatten. William im 19. Jahrhundert kämpft mit seiner Forschung um die Bienen. George kämpft 2007 darum, seine Bienen am Leben zu halten, während das große Bienensterben beginnt. Und Tao kennt im Jahr 2098 gar keine Bienen mehr. In China ist man zur Handbestäubung übergegangen. Als an einem freien Tag ihr Sohn verletzt wird, stellt sie alles in Frage. Es war spannend, die einzelnen Personen zu verfolgen. Jeder hatte mit Leid zu kämpfen und gab trotzdem seine Hoffnungen nie ganz auf. Immer habe ich darauf gewartet zu erfahren, wie sich die drei Geschichten verbinden. Auch wenn es nicht an die Qualität eines David Mitchells herankommt, war es trotzdem klasse, wie sich nach und nach die Parallelen und Zusammenhänge auftaten und am Ende war ich sehr zufrieden. Die Geschichte der Bienen wird erzählt und sie standen auf den meisten Seiten im Vordergrund. Faszinierend, wie sich Maja Lunde das Verschwinden der Bienen vorstellt. Wo etwas anfängt, wo die Hoffnungen lagen. Ich fand es äußerst geschickt gewählt, eine Perspektive in den Anfängen des Kollaps und eine weit danach spielen zu lassen. So kamen die Emotionen viel besser herüber. This story is told from three exceedingly different views. William lives in England 1852, George in the U.S. 2007 and Tao in China 2098. Each character shows us how important bees are to our society. While there are many dual time novels The History of Bees uses three time periods; a historical, contemporary and futuristic to provide a brief history of bees. A historical fiction contemporary dystopian novel-is there such a category? Even if you are not the least interested in honey bees this is such an interesting novel and yes all three stories are related.